It’s ten days since the last entry. There’ve been no big developments, but much that might be worth remembering in next year, or in 2010. We’ve continued to check for mushrooms every two or three days. We caught one more small flush of trumpets (and three chanterelles) in good time, and found the remains of another. There were shaggy manes in the front yard which Lisa made into a wonderful quiche for this morning’s breakfast. There’s also a small bag of puffballs in the freezer waiting to get big enough for a batch of soup. There’s been no rain since last Saturday, and no prediction of any. However as long as I keep seeing fungi around the house, I’ll use it as an excuse for a walk in the woods every few days. We are still getting worms and coccidia in the sheep. 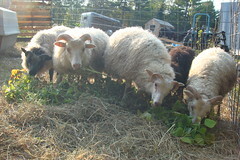 There are now five ram lambs in the infirmary pen in the front yard. Corvid and levamisole. The vet has warned us to be very careful with drugs. Levamisole is the only remaining antihelmetic. The worms here now resist all the others. Coccidia here are not yet resistant, but there are entire states down south where Corvid doesn’t work. Parasite resistance will definitely be one of our breeding goals, once we get past “female and alive” as the criterion. We’re keeping the two ram lambs that are unrelated to the rest of our flock, otherwise being a boy is being dinner. 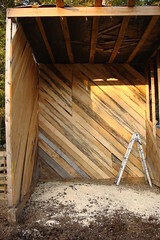 We finally put the last of the boards I’d cut onto the horse house and I changed the blade on the sawmill, and it wanders again. I’ll call Champion again tomorrow, but I really don’t see an alternative to a trip to Quebec City. 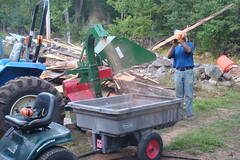 If that mill doesn’t work it changes the whole economics of the farm. We can’t saw against 2x4s and waferboard, but Lisa hates waferboard, and except for those two dirt cheap commodities we can net 30-50 tax free dollars an hour. Tax free is important. When I have to earn $45 to get $30 to spend at Home Depot it kind of does a number on Adam Smith. The chipper is also having issues. The feed roller largely isn’t. It’s belt has stretched. I’m wondering whether to attempt an adjustment or just get a new belt. If I had the parts book the new belt would be a no-brainer. Fortunately I’ve found someone who sells parts for the chipper. I’ll call and see if they can sell me a manual. I’m very very glad I bought the new tractor. Without at least one machine that just works we would be looking at housing in Woodley Park and jobs that would pay for it. 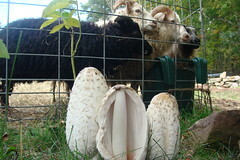 This entry was posted in Black Trumpet Mushroom, Chanterelles, Chipper, Farm Life, Horse Housing, illness, Mushrooms, Sheep. Bookmark the permalink. Post a comment or leave a trackback: Trackback URL.